Background Gastric cancer (GC) is the second most common cause of cancer-related death worldwide. Novel anticancer drugs against gastric cancer are urgently needed. Methods Compound 10 was designed and synthesized via a molecular hybridization strategy based on the natural product formononetin. It was evaluated for their antiproliferative activity against three gastric cancer cell lines (SGC7901, MKN45 and MGC803). Results Derivative 10 displayed potently antiproliferative activity with an IC50 value of 1.07 μM against SGC7901 cells. Derivative 10 could inhibit the growth and migration against gastric cancer SGC7901 cells through the Wnt/β-Catenin and AKT/mTOR pathways. From the in vivo expremints, it could effectively inhibited SGC7901 xenograft tumor growth in vivo without significant loss of the body weight. 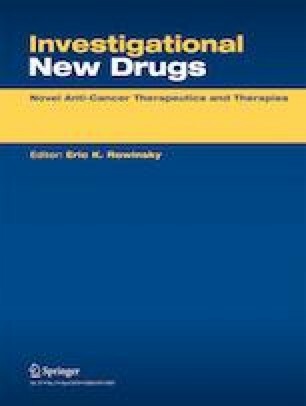 Conclusion Derivative 10 is an novel antitumor agent with potential for further clinical applications to treat gastric cancer. Jian-Ning Yao and Xue-Xiu Zhang contributed equally to this work. Thanks the support from The First Affiliated Hospital of Zhengzhou University. Jian-Ning Yao, Xue-Xiu Zhang and Lian-Feng Zhang designed the research. Jian-Ning Yao, Xue-Xiu Zhang, Yan-Zhen Zhang, Jia-Heng Li, Dong-Yao Zhao, Bing Gao, Hai-Ning Zhou, Shi-Lin Gao, and Lian-Feng Zhang performed all the experiments. All authors read and approved the final manuscript. This work was supported by the fund of The First Affiliated Hospital of Zhengzhou University.